CGWM Chamber Choir: A welcome to new members!! The Canolfan Gerdd William Mathias Chamber Choir took part in a concert at St Asaph Cathedral on Sunday the 24th of September as part of the Welsh National Opera Community Chorus and performed the Welsh premier of Oliver Tarney and Paul Mealor’s Magnificats. 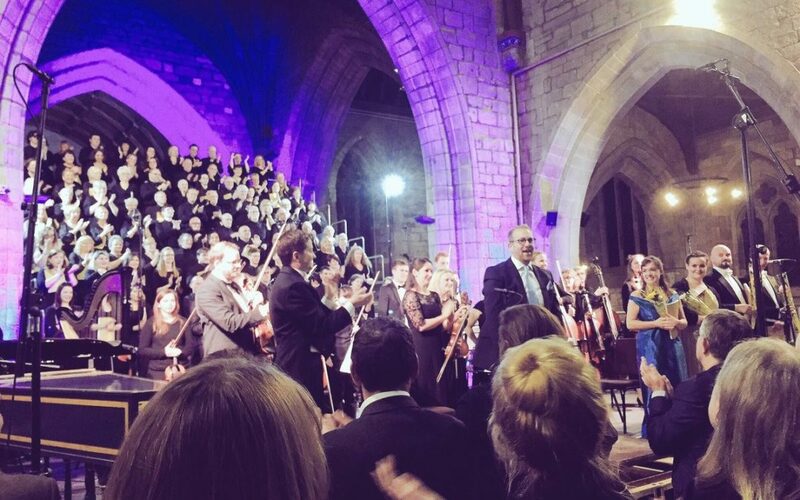 “This was a great experience for the choir to be part of the WNO chorus and to sing in such a stunning location as St Asaph Cathedral” said Jenny Pearson, the choir’s conductor. Jenny Pearson has been leading the Choir for almost a decade, and under her direction, the choir has experienced many successes, including taking part in a cultural exchange project with the Incantanti Choir from Switzerland only last year. Some of the more ambitious and most successful performances given by the choir in recent years include: Bach Magnificat, Handel’s Zadok the Priest, Fauré’s Cantique de Jean Racine and Mozart’s Requiem. Many of the choir members have gone on to sing with the National Youth Choir of Wales, WNO Youth Opera, and on to renowned conservatoires. With several of the choir members having moved on to universities and conservatoires in September, the choir is now very eager to appeal to new members to join the team. The first rehearsal in the series will be held for free, on Thursday the 5th of October between 4:45 – 6:00pm, at SP3, Galeri Caernarfon.